It was Miss Somers' turn to make the tea. Miss Somers was the newest and the most inefficient of typists. She was no longer young and had a mild worried face like a sheep. The kettle was not quite boiling when Miss Somers poured the water on the tea, but poor Miss Somers was never quite sure when a kettle was boiling. It was one of the many worries that afflicted her in life. She poured out the tea and took the cups round with a couple of limp, sweet biscuits in each saucer. That quote has very little to do with the plot of A Pocket Full of Rye, but it does set the tone of this story. 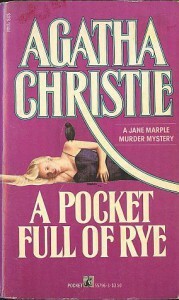 There is something edgy and sinister about A Pocket Full of Rye. This is not a "cozy" mystery. Sure, there is not blood or gore, but there is darkness, thirst for revenge, and calculating human horribleness. And that's what I see in the mention of tepid tea and limp biscuits. No, I kid. But I do see in this opening that there is something just not right, and it is this this feeling that runs through this story. I can't say that I liked this story a lot, and I can't even put my finger on why this is. Maybe it is because of the murder method causes me to have questions, maybe it because the police investigation misses the mark so often, or maybe it is because of that horrible children's rhyme that is the basis for this story, but it is not a story that I enjoy re-reading a lot. Nevertheless, I recommend it. The different relationship angles in this story are fascinating. Dark, but benefiting from Christie's acute eye for suffering that can be caused by family. Approach with strong tea, and sweet, rich, fresh biscuits.